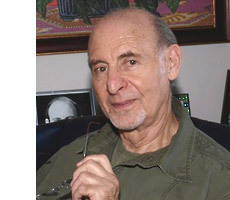 Michael Fisher was born in Johannesburg, and educated in Johannesburg South Africa, Israel and London, England. In 1989, he studied anatomy and physiology as part of his training at The South African Institute of Reflexology and received his certification in June 1990 and opened and ran a successful practice. Later he took courses in Vitamin and Mineral Supplementation and Diet with "Pharmica." In 1996, Michael began the process of being certified as a Resonance Repatterning practitioner and received his certification in November 1997. He later took advanced courses in the United States of America. He became an accredited teacher in "Empowering Yourself with Resonance Repatterning" and held regular seminars in Vancouver, British Columbia, Canada where he resides. In 2000 he embarked on the certification journey for Jin Shin Jyutsu and was certified in May 2002. Later he taught Self-Help workshops. Every new learning experience has been incorporated into his extensive practice. He was trained in the Core Principles of "The Body Talk System" and received his certification in December 2002. Michael uses his skills as an alternative health care practitioner to provide Integrative Healing Practices that provide a holistic health approach to natural healing, at a physical, mental, emotional and spirit level. I was invited by Dr. Lee Cowden to give a two-hour presentation to doctors, chiropractors, naturopaths and interested participants at the Academy of Comprehensive Integrative Medicine, providing them with a complete overview of Resonance Repatterning. So I flew to Dallas, Texas for the July 23rd presentation. Two hours disappeared in a flash as I used my Power Point presentation to illustrate how we are energy beings (Einstein, New Physics, Fritz-Albert Popp, the Chakra system, Meridian system and our bio-electric system). I talked about the hologram and how it pulls everything together, showing exactly how we create our reality through resonance and how we can change our reality through resonance. I then went into the autonomic nervous system demonstrating how muscle checking works "scientifically" and finally we covered the Mandala, illustrating how each aspect makes positive change and self-healing possible at the deepest level. When we ran out of time, they told me to keep on going, that they would take a shorter lunch break! At the end there was a group that asked how they could take the whole training! My presentation was filmed and once it is edited it will be available to doctors and participants of the Academy of Comprehensive Integrative Medicine on a continuing basis, not only in the USA but also for the Academy's participants in Europe and other countries. In the future the Academy will be translating their presentations into Spanish. Dr. Lee Cowden, who invited me, is Mercola's personal physician and Mercola is actively supporting Dr. Lee's work. In fact Mercola, who has a list of about four million, has just published an article on Dr. Lee Cowden a few days ago! Resonance Repatterning is a holistic health approach that facilitates positive change, to transform and achieve a heightened sense of well-being in life. Each session of Resonance Repatterning spirals up into a higher state of coherence. What we resonate with we embody. Resonance Repatterning is an effective means of creating desired change. Much of what holds us back comes from our subconscious patterns (unconscious patterns), or programming took place early in life. These unconscious patterns create static or interference that prevents us from having the happiness, abundance, and fulfilment in work, love and health that we desire. The patterns are not always part of our conscious awareness yet have a major impact on our life. Repatterning brings the unconscious patterns into our awareness, so they can be flat-lined by changing the frequencies we resonate with at subatomic particle level, cellular level. The process identifies these patterns, so that we naturally move towards a state of greater alignment, balance, harmony, and vitality, with our intentions---what we call coherence. To help create coherence, we create a holographic "map" of the patterns to be cleared--with the client's input and the use of muscle checking or applied kinesiology. Michaels practice includes phone-in sessions with clients internationally to the United States, Canada, the United Kingdom, Switzerland and South Africa. He does Proxy sessions on expectant mothers for babies in Utero. He works with animals where the owners have called for a session: that include horses, a pony, a parrot,' dogs and cats. Reflexology is the Natural Relationship of feet reflex buttons to rest of the body. It is a 5,000 year old natural health technique, incorporating knowledge of Anatomy and physiology, whereby a lack of alignment in the body can be traced to particular areas on feet. Reflexology helps the body to enhance Serotonin, the hormone and neurotransmitter responsible for keeping the brain and nervous system functioning. It rejuvenates and relaxes, it facilitates natural healing, eases pain, reduce stress and tension, and creates pleasurable relaxation. Michael specializes in alleviating the symptoms of premenstrual tension, menopause, back and neck problems, and asthma. Jin Shin Jyutsu, is an ancient art of harmonizing the life energy in the body. A gentle effective Japanese acupressure, that helps the body heal itself from symptoms of potential illness or stress. Jin Shin Jyutsu is a non-invasive effective addendum to the after-effects of post-operative procedures. The practitioner uses the fingers on specific points on the body. Holding 'Safety Energy Locks' in combination can bring balance to the body, mind and spirit: an ability to harmonize and balance ourselves and/or others. This noninvasive acupressure point system helps to realign the body and bring it back into focus for optimal health. It is an innate part of man's wisdom simplifying the complexities of existence. Michael Fisher through Personal Development Mentorship facilitates an individual's ability to push the envelope and maximize their potential in whatever area of life they focus on. Michael uses his skills to help you to live with positive intentions- begin to live life from unending possibilities, for financial security, growth, health and purpose, instead of living life from the point of view of your problems. Personal Development mentoring encourages you to manage and maximize your potential, through focused, experience based mentorship. It involves a personal developmental relationship that helps to guide you and sustain your highest potential. The connections he makes with his clients are most important to him. A caring practitioner, Michael gives his best to his clients. Michael strives to be a good listener and empathizer with his clients. He takes his clients' fears and concerns, pain and disease, physical, mental, emotional and spiritual and turns problems into opportunities. Using his extensive knowledge in the healing arts, Michael is able to address each client's problem with right action, with respect for the body's innate wisdom as to how it can heal itself, thus turning a problem into an opportunity for healing and health so that the client can spiral upward into greater coherence and energy. Click here for consultation details on Michael Fisher. Click here for radio interview with Michael Fisher. Click here to read others' experiences with Michael Fisher.